And so the theatre has been demolished. A flex banner at the entrance to the vast compound has it that “Pilot Theatre is demolishing” and then adds, “Trespasser will be prosecuted,” thereby indicating that groups are most welcome. But the groups or crowds have long ceased coming to Pilot. The property’s history begins with Pilot, that popular brand of fountain pens that many of us grew up with. The Pilot Pen Co (India) Pvt Limited, founded by Paranjothi Arockiasami Sanjivi, a local entrepreneur, was established in 1952. It manufactured pens in Madras, under licence from Pilot Corporation of Japan and hence the name. The corporate office of the company was at the Catholic Centre, Armenian Street. The Sanjivi family being devout Roman Catholics and the progenitor contributed generously to church-building activities in Madras. Legend has it that the first factory for the Pilot Pens, when it was more an assembly operation, stood at the site of the Pilot Theatre in Royapettah. 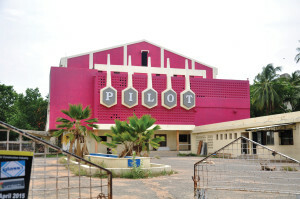 But even as early as 1961, the works had shifted to Puzhal, where even now a vast premises goes by the name of Pilot Compound and is rented out by other commercial entities. Under Sanjivi, Pilot Pens prospered. He then decided to get into cinema screening and put up the Pilot Theatre. Completed in 1968, it was India’s second screening facility with Cinerama technology, the first being Bangalore’s Kapali. In this innovation, three projectors simultaneously ran three strips of the film, all of which synch-ronised on a giant arced screen thereby making for an awesome visual effect. This was, however, not a success and Wikipedia has it that just two films were ever made using Cinerama. It is not clear whether the same projection could be used for conventional screening but it would appear that Pilot retained the same projection facilities. The first screening was on November 15, 1968, the film being The Ballad of Cable Hogue. Sadly for Sanjivi, his pen company did not long outlive him. It went into liquidation in 1978. By then, the pens were no longer what they had once been – leak-proof and with excellent steel or gold-tipped nibs. Chea-per plastic had come in and most Pilot pens were known to leave ink stains – on fingers and clothes. The arrival of the ball-point hastened the company’s demise. As for Pilot Theatre, after being a facility where only the best of English films were shown, it slowly settled down to vernacular films and, later, re-runs. Its vast compound was however a great attraction for film shoots. It was also a popular venue for film festivals. Inheritance issues led the successors to seek the assistance of the High Court of Madras and a settlement was reached sometime back. The theatre stopped screenings in 2014 and with that it was clear that the curtains were coming down. Pilot will live in public memory via Pilot Lane, an impossibly narrow thoroughfare running along the theatre’s northern bound. This links Gaudia Mutt and Royapettah High Roads and was once a space through which water supply was made to eastern Roya-pettah. A couple of years ago, a signboard painter’s error had led it to being named Polite Lane and caused much mirth. The residents however were not amused. They now have little cause for cheer for the lane is a convenient rubbish dump, a urinal and is forever filled with traffic.